We have seen in earlier sections(2.7) that a linear equation is represented a by a line on the graph sheet and hence the name linear equation. We have also learnt that we need two equations to solve simultaneous liner equations. From these observations, it becomes logical that why not represent the linear equations graphically and then find a point on the graph sheet which cuts the lines representing the given linear equations. 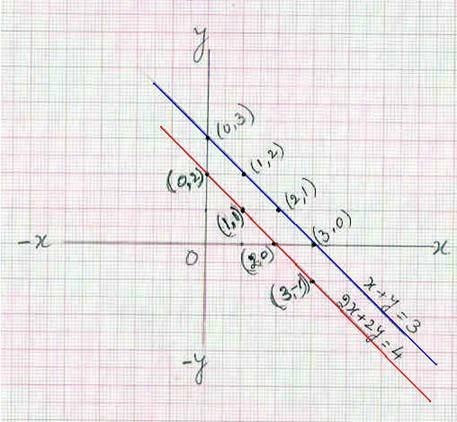 7.4 Problem 1: Solve 2x-y =3 and x+2y =6 graphically. 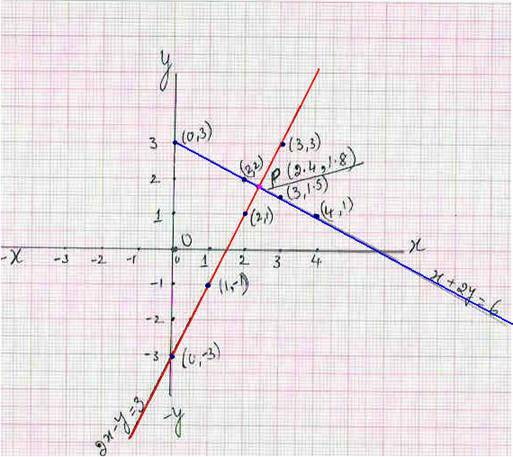 Consider the equation 2x-y =3 and draw a graph for this line on a graph sheet. Step 3 : Plot the points represented by (x, y) coordinates on a graph sheet. 1. Though only two points are enough to draw a straight line, we have calculated more values of (x, y) to indicate that there are many solutions to 2x-y =3. line 2x-y =3 satisfy the given equation. We need another line crossing this line on the graph so that we get an intersection point .The coordinates of this point will give unique solution to these 2 equations. Step 7 : Plot the points represented by (x, y) coordinates on a graph sheet and join them to get a straight line. Step 9 : Find the coordinates of P which is (2.4,1.8). By Substituting 2.4 for x in (2). Step 5: Since this equation is same as2x+2y=4, The (x,y) coordinate pairs can be obtained from step 2. Conclusion : There are infinite values of (x, y) which satisfy the given set of equations. Hence there is no unique solution to the simultaneous liner equations: 2x+2y = 4 and x+y = 2. Verification: Refer 2.14 problem 3. Verification: Refer 2.14 problem 4. The equation for cost of manufacturing articles is CP=3x+50. Thus for x=50, CP=SP=Rs 200 and hence our solution is correct. 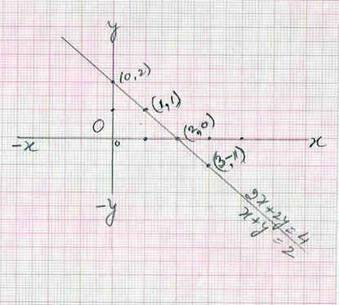 Simultaneous linear equations can also be solved by drawing graph for each of the lines. The intersection of the two lines gives the solution.